Every year, the Bay Area and the world inducts new beauty, wellness, and health companies that seem to change the status quo of the industry. Of course, ripe for disruption, we’ve seen the likes of alternative healing and wellness, CBD, and so forth gain serious popularity in the year 2018, coming into 2019. But how did the Bob Cut editor’s rank, review, and place the items we loved in this guide? You ask so many good questions. Through the power of recommendation of our editors, friends, close colleagues and, Bay Area industry veterans—we pulled their knowledge of the landscape and asked for their top five items. In this deduction, we narrowed in on repeat winners and also kept close tabs on platforms like Instagram, Facebook, and beyond. We had a fairly hearty list but to make sure we were recommending the best of the best, we narrowed everything down to our top 9. So enjoy. What you can expect from this guide is a variety of price ranges, a curated selection of Bay Area winners, and a spectrum of functionalities for your whole body and mind. Let this guide be your jumping off point in discovering a product that you’ll fall in love with like we have. // Photography by RC Rivera, styling by Anthony Rogers, assisted by Maisie Leung, creative directed by Tin Dinh, test + researched by the Bob Cut Editors. What goes on your body is equally important, the face is a sensitive area but we also forget about a part of the body that needs constant maintenance—the pits. For Nymph, creating a line for body care came from a need of not finding products on the market that weren’t disruptive to the delicate skin around the armpits. The brand’s all-natural Coconut Deodorant is freshly made in small batches to deliver relief while moisturizing the skin and neutralizing underarm odor for hours! Best of all, you can expect an alcohol and aluminum free formula, no synthetic fragrances, plus cruelty-free testing. We noticed an aromatherapy type appeal with this deodorant as its natural fragrance is quite robust, if you’re not down for fragrances at all, Nymph has a fragrance-free option as well. In 2019, consumers demanded they know where their products were made, sourced, and how clean they were in comparison to products of yesteryear, so when April Banker of Healing Studio started her little witches cove—she created a small yet mighty line of botanical essentials. The steam distilled hydrosol water is made from organic rosemary leaves and flowers. Handpicked, harvested, and sourced from Jellicles Farm in Sunol, CA which Healing Studio has a close relationship with. We use this spray as a toner day and/or night or to refresh make-up throughout the day. Spray on. You may leave your heart in San Francisco but the smells and notes of the shoreline, iris, and chocolate can’t ever leave you. Fill your spaces with the top notes of coffee, chocolate, mid notes of sea wave, iris, clove, and base notes of sea moss and musk. To really encapsulate on the multi-dimensional smell, we suggest also getting a candle capsule to a.) easily put your candle out and b.) trap the smell and disperse it evenly though your space. And for our design-thinking readers, the candle sits seamlessly with our Hygge style flat. You know what colors work for you and you aren’t looking to buy palette after palette to find those must-have colors, this is why we love Christina Choi. Her wide variety of eyeshadow pods come in singles and can be mixed and matched to our liking. Not to mention that we can use the pods for different portions of the face. Eyeshadow, blush, liner, brow, the list goes on. We recommend Creamsicle as it’s the perfect range of peach and gold. Simple, understated, and a color we come back to over and over again. In the past year and a half, we’ve been seeing the need of having spiritual wellness take the lead when it comes to healing from a variety of emotional stages in our life. Whether it’s meditation, recovering from a bad break-up, or needing focus and guidance—the Smudge Spell Kits come fully equipped in cleansing yourself, your home, and/or your intentions. You may think it’s mumbo jumbo but to others looking to connect themselves with their mind, this kit is a step in an ultimately centered you. We suggest using this kit immediately on arrival—you are also given a variety of instructions on how every object works and how to use them successfully. Oum. If you were looking for a night oil that’s light on the skin yet does the damn job—Corson Beauty takes the cake. And in emergencies where your skin is going erratic, the night oil truly comes to the rescue. Chalk full of botanicals like chamomile, rosehip seed oil, and squalene, you’re essentially giving the skin a nightly juice cleanse. We suggest using this product at night before bed on it’s own—it plays better by itself. Going overboard on the nightly creams or serums will clog your pores with a fierce intent. When applying to the skin, push and press the serum into the face rather then swiping or dragging, you’ll get the most potent results out of your oil. CBD, you love it, you hate it, but it’s trailing into your daily skincare + body care. And we’re loving it. Cannabinoid receptors are located throughout the skin, the body’s largest organ, making CBD a potential therapy for a range of conditions, from dry skin to acne. Truly a super ingredient. The HORA Super Serum is a potent creme that creates a relieving sensation to aches, pains, and soreness. We didn’t see much of a difference on our face than we did on our body. We suggest applying a small amount to a clean dry body morning and night where soreness may be felt. We do not suggest applying this anywhere near the groin area, think shoulder, arm, and leg muscles. What started as a need to get a new face mask quickly turned into “holy grail” for one editor that when asked what masks they recommend, they immediately and indefinitely recommended the Pin Up Cosmetics Wild Rose Clay Mask. Plus with its easy pick-up from our local Rainbow Grocery, we stock piled this powder. The mask is made up of a few key (and only) ingredients: rose essential oil, roses, rose absolute, french clay, french rose clay, lavender essential oil. That’s all. We suggest using this mask mid-day to lift and tighten your skins complexion. Be wary of leaving it on too long as it will stain your skin due to the rose absolute. Trial and tested. The hunt for a moisturizer that has the richness of a cold creme but the lightness of an essence was near impossible. But for Chief Scientific Officer Lindsay Wray, PhD, it’s all about the science. Eighteen B which launched on market guns blazing has started to rewrite the conversation about effective moisture products. 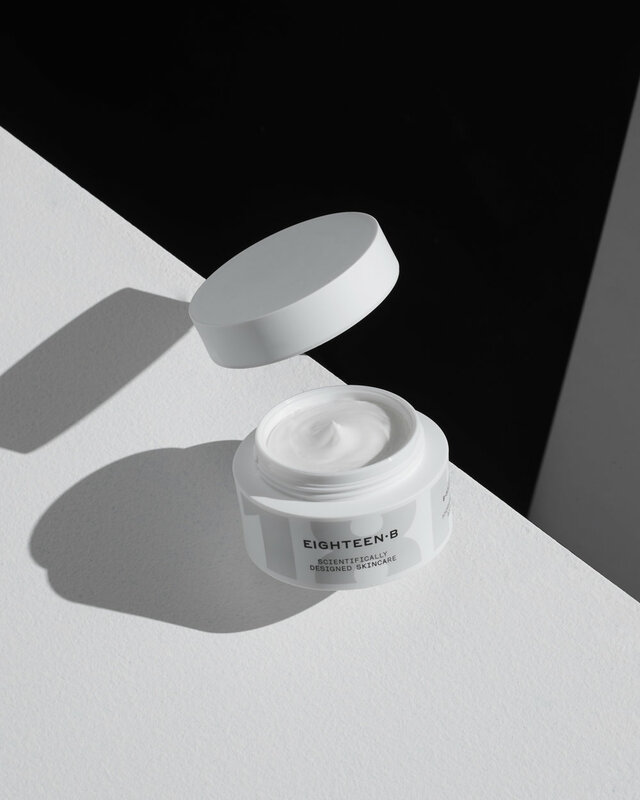 This rich cream delivers an immediate hydration boost as well as long-term restorative firming, visible lifting, and increased elasticity; diminishing the look of fine lines and wrinkles. And the science doesn’t lie, on the website, you can research every component that enters the moisturizers life-cycle. From our editors standpoint, we were shocked how cooling the formula was. When building the product up on the skin, apply in multiple light layers instead of one glob of product—this way you can achieve your optimal level of hydration. Click here to read last year's Big Beauty Edit. The Big Beauty Edit + more delivered weekly straight to your inbox.